The Carr Fastener Company introduced a grease gun for automombiles and heavy equipment that featured an acme thread with a 1/4 turn engagement. 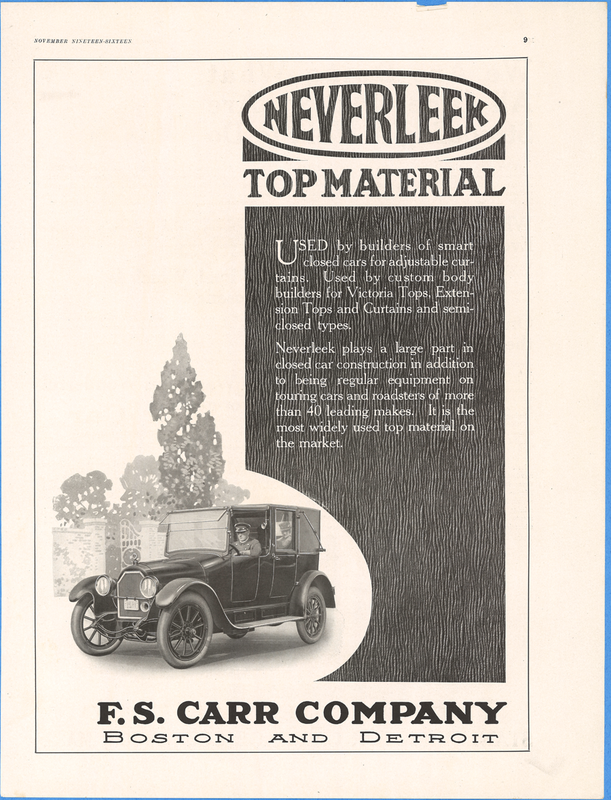 The company was primarily known for its fasteners for such things as tops and side curtains. These grease fittings were used on late model Stanley Steam Cars, including the Model 740, Model 750, and the 1925 and 1926 SV or Steam Vehicle Corporation cars. 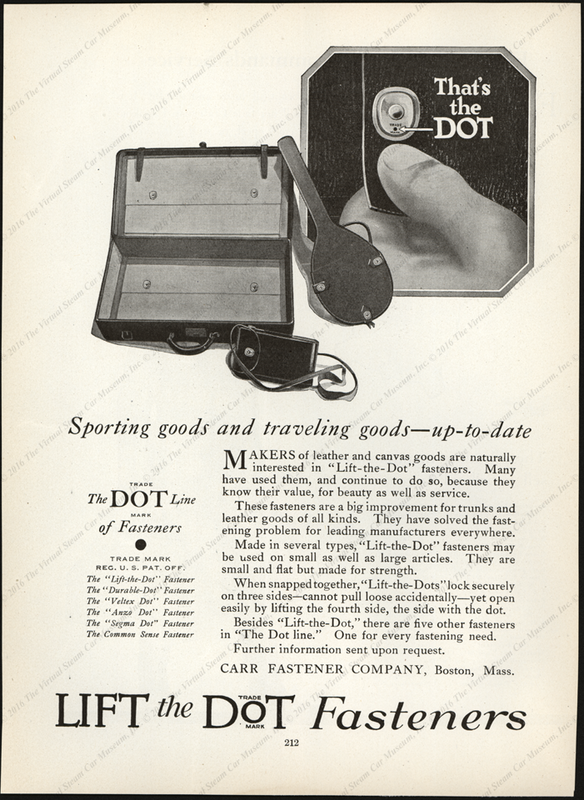 The F. S. Carr Company placed this November 1916 advertisement in Life Magazine. It promoted the company's NEVERLEAK top material and fastening hardware. 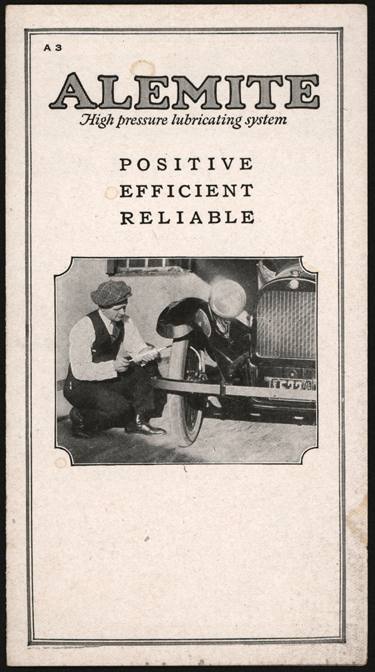 The Carr Fastener Company, renamed from F. S. Carr, placed this 1920 advertisement in an unknown publication, page 212. It promoted the company's fasteners, which were widely used in military service during World War II. 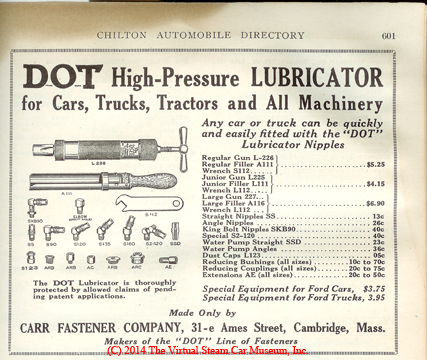 The Carr Fastener Company promoted its high pressure grease gun in the October 1922 issue of Highway Engineer and Contractor. The short article describes the use of the gun and its easy attachment to the grease fitting. 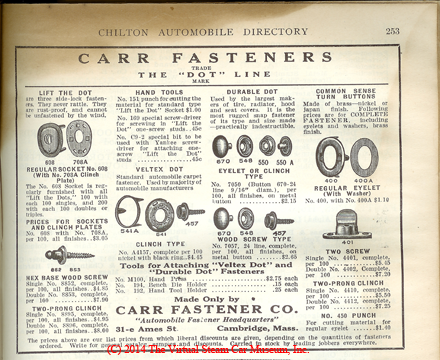 The Carr Fastener Company placed two advertisements in the July 1925 issue of the Chilton Automobile Directory.The first, on page 253, featured the Company's fasteners. 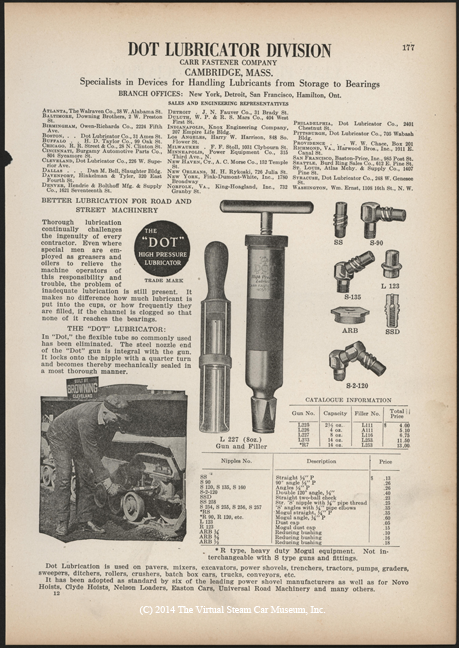 The second, on page 601, featured its grease gun and grease fittings. 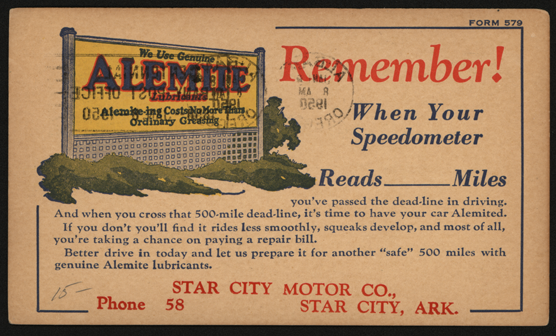 At some time in the late 1920s or early 1930s, Alemite purchased the Carr DOT Grease gun and fittings. These were featured in the Alemite catalolgue for some years. 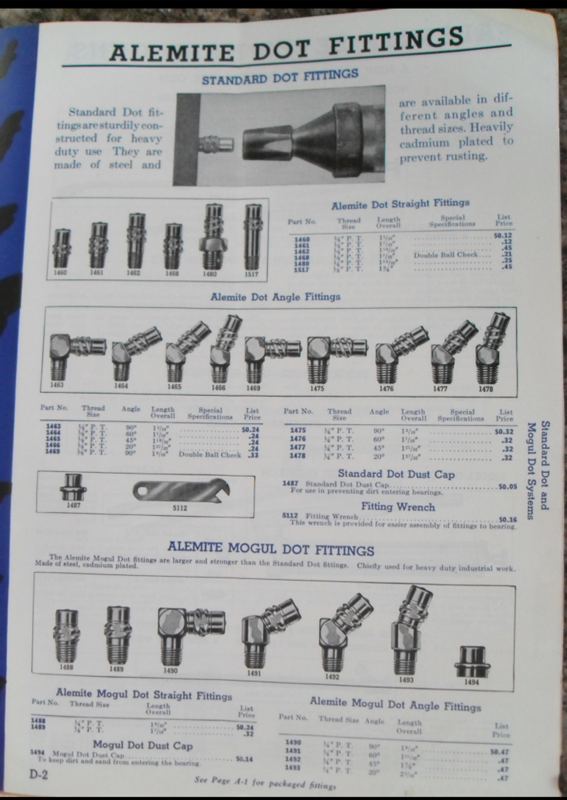 The Bassick Manufacturing Company made Alemite grease fittings. This catalogue dates from about 1925. 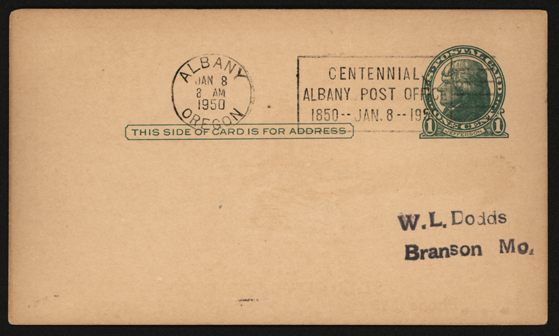 This Alemite advertising postcard is postmarked January 8, 1950. Contact us if you have additional information about the Carr Fastener Company, or if you have questions.